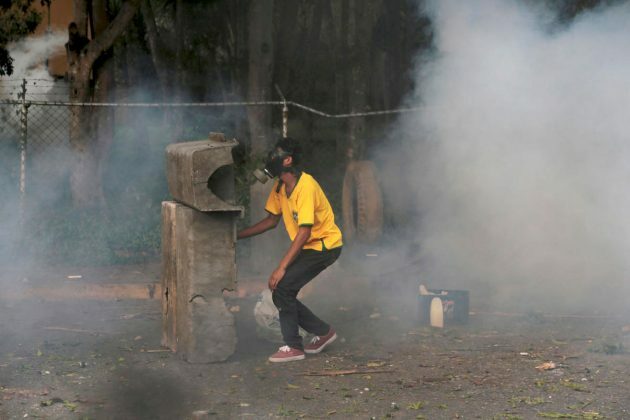 Thousands of protesters were met with plumes of tear gas in Venezuela’s capital Wednesday, just a short distance from where President Nicolas Maduro delivered a decree kicking off a process to rewrite the polarized nation’s constitution. Surrounded by top-ranking socialist officials, a riled-up Maduro told supporters dressed in red outside the National Electoral Council that the constitutional assembly was needed to instill peace against a violent opposition. “I see congress shaking in its boots before a constitutional convention,” he said, referring to the opposition-controlled legislature, after dancing alongside the older brother of the late President Hugo Chavez. Nearby, national guardsmen launched tear gas at demonstrators who tried to march toward the National Assembly. The confrontation grew increasingly violent, with anti-government protesters setting an officer’s motorbike on fire. At another point, an armored vehicle set aflame pushed into a crowd of demonstrators. Freddy Guevara, the legislature’s first vice president, was whisked away by fellow protesters after apparently being struck in the foot by a tear gas canister. He later emerged with white bandages wrapped around the wound, vowing to stay in the streets until the opposition triumphs. “An injury from your dictatorship is a medal of honor,” he tweeted to Maduro. 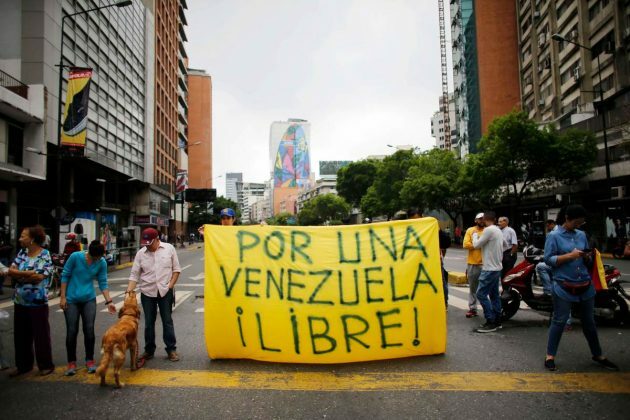 The latest push by Maduro to settle the political crisis comes as the Trump administration warns it might impose more sanctions on Venezuelan officials and members of the U.S. Congress are pushing the administration to act more forcefully to rein in Maduro. On Wednesday, a bipartisan group of senators introduced legislation providing humanitarian assistance to Venezuela while toughening sanctions against corrupt officials. The legislation also would instruct the intelligence community to prepare a partly unclassified report on Venezuelan government officials’ involvement in corruption and drug trafficking. Five people have been killed in Venezuela’s unrest since late Monday. Two died when the bus they were traveling in flipped as it tried to avoid a barricade set up by protesters, according to opposition activists who live near the accident site in Carabobo state. A third person was killed during looting at a shop in the industrial city of Valencia and a motorcyclist died after being struck by a car trying to swerve away from a protest, the chief prosecutor’s office said. At least 35 people have died in the political turmoil that has gripped Venezuela for a month. Hundreds more have been injured, including more than 150 on Wednesday alone. 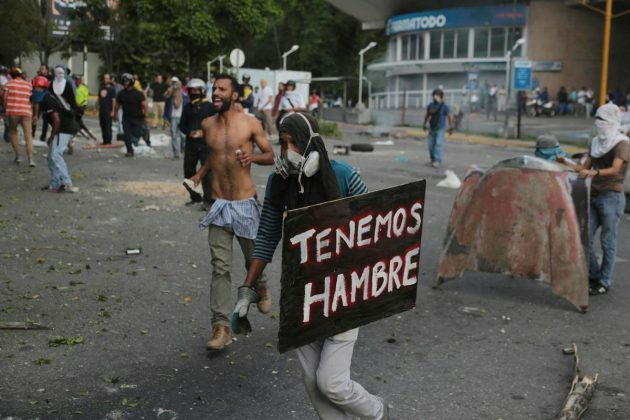 Caracas-area mayor Ramon Muchacho said 137 of those injured Wednesday suffered cuts, fractures and other wounds. “We’ve never had so many patients coming in from a protest as we did today,” he said. Driving the latest outrage is the decree by Maduro to begin the process of rewriting Venezuela’s constitution, which was pushed through in 1999 by Chavez, his predecessor and mentor. Opposition leaders call the planned constitutional assembly a ploy to keep Maduro and his allies in power by putting off regional elections scheduled for this year and a presidential election that was to be held in 2018. Opinion polls have suggested the socialists would lose both elections badly at a time of widespread anger over triple-digit inflation and shortages of food and other goods. Luis Emilio Rondon, one of five members of the electoral council and the only one who in the past has sided with opposition initiatives, said Maduro’s decree alone was not enough to convoke a constitutional assembly. He contended the idea of holding an assembly would need to go first to Venezuelans for a general vote, a step the president did not mention in announcing its creation. “It should be submitted for the consideration of all voters on the national registry,” Rondon said. The proposed U.S. legislation, written before Maduro’s latest move, is co-sponsored by Sen. Ben Cardin, the top-ranking Democrat on the Senate Foreign Relations Committee, and Republican Sen. Marco Rubio, who authored earlier sanctions legislation on Venezuela. It also has the support of Sen. John Cornyn, the chamber’s No. 2 Republican, former Democratic vice presidential nominee Tim Kaine and Republican Sen. John McCain, chairman of the Senate Armed Services Committee. The U.S. already has sanctioned several Venezuelan officials, including Vice President Tareck El Aissami in February for allegedly being a major cocaine trafficker. The new legislation seeks to put into law executive action by the Obama administration that targeted officials involved in corruption and found to “undermine democratic governance” with sanctions freezing any U.S. assets and banning them from entry into the U.S. It also would mandate $10 million a year in humanitarian assistance to Venezuela. Maduro has rejected such aid offers as attempts by the U.S. to pave the way for foreign intervention. Clashes in Venezuela as Maduro Starts Constitutional Rewrite. Thousands of protesters were met with plumes of tear gas in Venezuela’s capital Wednesday.